As some people are able to create colors, shapes or ideas, we have chosen to create moves. Because music is a constant movement, in which all its parts must be simultaneously felt as a spiritual unity of the soul. 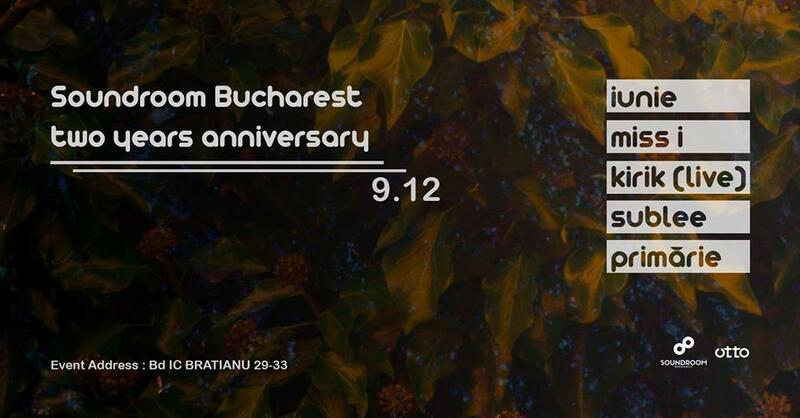 We’re celebrating two years of Soundroom Podcast, with a special gathering at OTTO Bucharest. The line-up will be a Romanian symphony played by Iunie, Miss I, Primărie and Sublee and completed by our special guest from Ukraine, Kirik, which will prepare us a live set containing its newest tracks. Funktion One Sound System. There is one thing great parties have in common: Great sound! If you like good quality sound, there is no better place to be.